2019 is a big year for the Hyundai Elantra. Many changes have been made to the exterior appearance, including a wider grille with horizontal slats. On the upper corners of the grille, drivers will find headlamps with LED running lamps. Moving around to the back of the vehicle, there is a new design for the trunk lid and taillights. The rear license plate also has been moved from the trunk to the newly designed rear bumper. On the inside, drivers will appreciate the sound-absorbing materials. All trim levels will also now feature a rearview camera with dynamic guidelines. The 2019 Hyundai Elantra offers six trim levels: they are the SE, SEL, Value Edition, Limited, Eco, and Sport. 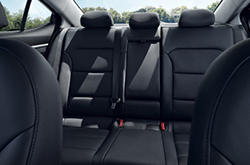 As usual, each trim will be a 4-door FWD vehicle that comfortably seats 5 people. The available 7-inch display audio works great with compatible smartphones. The new Elantra has Apple CarPlay as well as Android Auto compatibility. 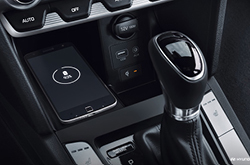 Drivers of the Limited trim can enjoy a wireless charging pad, as well as leather seating surfaces and the Infinity® Premium Audio with HD radio with 8 speakers. Each trim level comes with USB and auxiliary input jacks, and the upper trims feature dual charging USB ports. A 5-inch display screen comes standard on the base trim, while all of the others get a 7-inch one. Drivers of the Limited trim can choose to upgrade to an 8-inch screen that includes navigation. On the outside of the new Elantra, drivers will find solar control glass as well as a chrome front grille. The upper trims can enjoy a hands-free smart trunk release as well as door handle approach lights. All trims with the exception of the base SE come with heated side mirrors. These mirrors on the Limited trim feature turn signal indicators. There are three different engine options for the 2019 Elantra. The Eco trim comes equipped with a 128-hp, 1.4-liter I-4 engine that works in conjunction with the 7-speed auto-shift manual w/OD and auto-manual transmission. Coming in the SE, SEl, Value Edition, and Limited is the 147-hp, 2.0-liter I-4 engine option paired with a 6-speed automatic w/OD and auto-manual. Finally, those who elect to go with the Sport trim will enjoy the 201-hp, 1.6-liter I-4 engine with a 6-speed manual w/OD. There are many wonderful safety features found in the Hyundai SmartSense bundle. Certain trims will have the option of adding Driver Attention Warning, Lane Keeping Assist, Forward Collision Avoidance Assist, High Beam Assist, Smart Cruise Control, and Blind-Spot Collision Warning. The new Safe Exit Assist uses radar to alert passengers when a vehicle is approaching from the rear, helping them avoid stepping out of the vehicle when it is not safe. 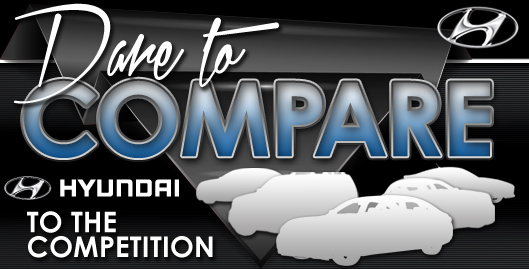 For all trim levels, there are many safety features that come standard. They include a tire pressure monitoring system, anti-lock brakes, electronic stability control, vehicle stability management, a traction control system, electronic brake force distribution, and brake assist. In the event of a crash, there are seatbelt pretensioners, advanced dual front airbags with Occupant Classification System, a driver's knee airbag, side-impact airbags, and side-curtain airbags. 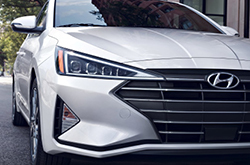 The 2019 Hyundai Elantra should be experienced in person and the best way to do that is come into our Carrollton dealership and take a test drive.